I decided to watch this because I had watched the first two seasons. I was curious to see how this would turn out. I would say it was similar to the previous seasons. The plot was focusing on the competition and it was about Kanade getting back her love for music. As opposed to the first season, where the main character was able to play violin because her instrument was magical, I preferred this one, where the main character was a violin prodigy to begin with. It felt like everything she achieved was through her own hard work and it made the story easier to relate to. The art style was the same as from the previous seasons, which is good. It made the universe of the story coherent with the previous one. Some previous characters even made a small cameo appearance. The music selection for the competition was classic, of course. I liked the arrangement they made to these pieces, notably Winter by Vivaldi and Danse Macabre. It made the performances enjoyable. Ave Maria has been played as well. I find that this piece was an important one in the first season and for it to be used again in the third season created a nice bridge to link them together. The characters were somewhat annoying sometimes. I think their development occurred a little late. For a major part of the beginning, Kyouya just seemed to display a lot of misplaced anger without any clear explanation about it and it appeared redundant after a while. Kanade is shown as being naive and somewhat weak. I easily got nervous watching her, wondering if someone would say something that would make her hesitate again. Myoga Reiji's grudge against Kanade also seemed a little redundant. The nature of his grudge was easily predictable, but the whole back story could've been revealed a little bit earlier. We could see Kanade remembering fragments of it, but instead of repeating the same sequence for the entire serie and then throwing the rest at the end, it would probably have been better if they showed a little more each time as the story progressed. Overall, this anime was fine, but it wasn't the best. The plot was too similar to the one from season one. The characters also made me cringe a few times. Still, if you liked season one, then you might like this spin-off as well. I have to admit reverse harems are my guilty pleasure. I grouch about the mediocrity of them but still watch (or at last try to watch) every single one. With this one, episode 6 is probably as far as I go. Wow, such a disappointment. 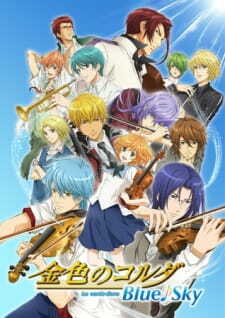 The original La corda d'oro was, for me, one of the best in it's genre. It made me fall in love with the classical music and its characters, it's beautiful and quiet love story. This one is even worse than the average otome game reverse harem adaptation; even Kamigami No Asobi is doing a better job of keeping me interested this season. The music is more like a background than something important to the characters even though it supposed to be the center of their lives. There are no memorable performances, nothing to really strike the chord. Even the ones that are supposed to be outstanding only make me want to push fast forward button. The animation is poor, it's like the performer is a bad actor that pretends to play the instrument for the camera. No character development or relationship development. Too many characters are introduced all at once and we only get a passing glance at them, but don't actually have the chance to get to know them and, as a consequence, start liking them. They are flat, cliché and not at all engaging. The storyline is jumping ahead at the breakneck speed. It looks more like a collection of scraps from the different points of the timeline. All in all, while I may have been a bit harsh some places, this is still nothing but a disappointment. I saw the original La Corda D'Oro anime when it came out in 2007, but it took me a LOOOONG time to finish it. I can't remember why. Maybe it was due to school or lack of interest. But I completed it along with the OVA. I don't remember much after that. I have the first six volumes of the manga, and read more at my local library. But it didn't strike a chord with me much, and to this day, I still don't care for it. Actually, I wasn't intending on watching this. But when I found out it was going to be 12 episodes long, I figured I might as well watch, since I needed to watch a short anime before the summer ends. It has good qualities, but they're all overshadowed by blandness, over exaggeration, and other problems. The story's about Kanade, a girl who, along with her two childhood friends, transfers to Seiso Academy so they can compete in the various musical competitions. That's mostly it. The story's just about her ensemble practicing and partaking in the music competitions. There are some moments where they have fun and take breaks, but they don't really do anything to really develop the characters and make them more well-rounded. This is one huge flaw of the series: the characters. Their designs are generic, and their overall characters are really bland, only having one or two personality traits besides an obsession with music. One character (who looks like a rip-off of Tamaki from Ouran High School Host Club, seiyuu and all, but with purple eyes) doesn't do anything except play piano and act like he's in love with Kanade, which really turned me off. One thing I do, however, like about Kanade, the main character, is that unlike the main character in the first series, who was just handed a magical violin from a fairy, Kanade has been practicing the violin for years. Isn't it great to have main characters who are good at something?! But even then, it doesn't save her from being bland and underdeveloped. There is one character who I ABSOLUTELY loathe with a passion: Myoga Reiji. Why? Because he spends 99% of the series either talking down on other people and blaming Kanade for something so stupid, lame, and exaggerated that I can't believe people thought this kind of character would work. He's driven and passionate, yes, but he's only defined by his hatred for one other character, and for the stupidest, lamest, dumbest reason ever. That's NOT how you write a character! It really doesn't help that he, like the rest of the cast, seems to believe that music defines his existence. Speaking of which, here's another problem I have with both the series and the characters. While it's great to like something and be passionate about it, there's a fine line between being passionate about music and acting like it's the only thing you live for. Here? EVERY SINGLE CHARACTER acts like not winning the music competition is tantamount to having absolutely no reason to exist, like devoting their lives to music defines their very existence! It's like these people are absolutely obsessed with music to the extreme! I may like drawing and writing, but I don't act like drawing and writing are God! And not only that, because everyone acts like winning the competition is like reaching Nirvana, everyone's reactions to their losses and everything else comes off as extremely forced, superficial, and melodramatic, complete with exaggerated expressions, and I don't mean the kooky, cartoony kind either. Because people act like music defines their existence, they make the biggest deals out of the littlest things, like Reiji's reason for hating Kanade. Without giving away spoilers, I'm sure he felt offended by what Kanade did, but he really didn't have to take it so personally to the point of threatening her, holding it over her head, treating her and others like garbage, and acting like she's some kind of arrogant glory hog! He needs to get over it, as there are better reasons to hold a grudge against someone, and his reasons are petty. But these aren't the only problems the show has. There's only twelve episodes, and there's so many characters that there isn't time to develop them. I know nowadays anime are mostly commercials for manga or light novels or games, but that's still no excuse to not utilize the story and characters. While I do admit the anime has a great soundtrack as I'm a fan of classical music, sometimes I feel like certain BGMs during scenes get abruptly cut off when transitioning from one scene to another, making it feel like the creators couldn't use pieces that actually felt complete in its designated scene and just used BGMs that went over the scene's duration time. It just felt really jarring to me. Not only that, the story doesn't have very much scope, and the characters' unhealthy obsession with music just makes it come off as superficial. The lack of development for the characters gives us no reason to care about them or their plights. Also, the animators can't seem to decide how long they should make Kanade's skirt, which makes her body look really oddly proportioned, even in the opening sequence. They can't seem to decide if they want her skirt to look short like most anime skirts even though it's not a miniskirt, or if it should go to slightly above her knee, like in the promotional picture. Not only that, you know that magic ring she has around her neck? It basically serves no purpose to provide visual Deus Ex Machinas for the audience she plays for, and the illusions it shows are all real to the audience. It makes no sense, and although it has an explanation, it's still flimsy and forced. This isn't to say the anime is outright bad. For example, I was pleasantly surprised by the voice actor choices in this anime. It reuses a lot of actors from the first La Corda anime, but this anime does interesting things with the actors. Instead of having them play the exact same type of character, it makes them play against type. For example, Jun Fukuyama voiced the woozy, quiet, and spaced out Keiichi in the first series, while in here he plays the loud, opinionated, hot blooded Kyoya. Reiko Takagi, the voice of Kahoko in the first series, uses a much higher voice for Kanade. Kisho Taniyama does the voice of the stoic, blunt, and cold Len from the first anime, while in here he plays the loud, flamboyant, and also blunt Chiaki Togane (the blonde guy who plays the electric violin). Masakazu Morita plays the cheerful, friendly, and outgoing Kazuki in the first anime (who actually appears in this anime along with Len as cameos! The reason being that this anime takes place eight years after the first anime) while here he plays the scary looking, delinquent-like but shy Hozumi. It's always fun to see voice actors go against their typecasting every now and again, even within the same franchise! Not only that, the anime has done a lot of research regarding classical music and instruments, even electric violins, which aren't shown in the first anime. It's always nice to see different kinds of instruments, both old and modern. This show is mostly bland. It could have been worse. If you like classical music, check it out. But don't expect a well rounded story with well developed characters. I started to watched this because I like the first season so much but sadly this anime is disappointed. It is not good as the first season. It doesn't make me excited to watch the next episode. Too many character introduced at once. It doesn't really show the beauty of violin and other classical music like the first season does and of course the male characters is not ikemen as the first season. Less romance in this anime. Maybe this is the big factor why I don't like it. I'm too expect this anime is good as the first season but sadly I disappointed. This is the first and last I watched it. I won't re-watch.